Overcoming the regulatory hurdles and safety issues posed by drones appears to be a challenge even for the online retail giant. 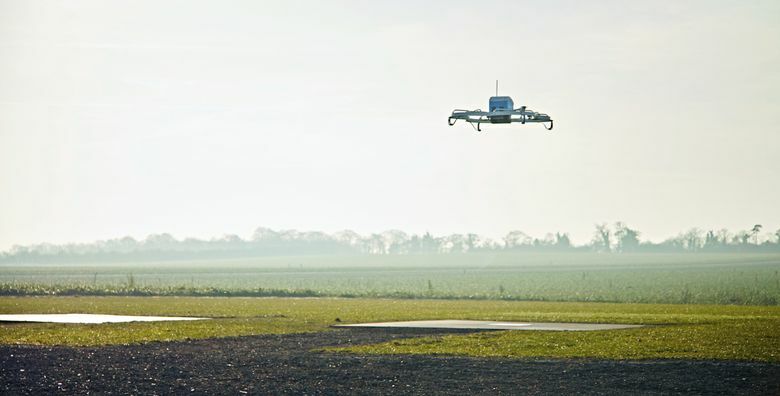 Jeff Bezos boldly predicted five years ago that drones would be carrying Amazon packages to people’s doorsteps by now. Amazon customers are still waiting. And it’s unclear when, if ever, this particular order by the company’s founder and CEO will arrive. Bezos made billions of dollars by transforming the retail sector. But overcoming the regulatory hurdles and safety issues posed by drones appears to be a challenge even for the world’s wealthiest man. The result is a blown deadline on his claim to CBS’ “60 Minutes” in December 2013 that drones would be making deliveries within five years. The day may not be far off when drones will carry medicine to people in rural or remote areas, but the marketing hype around instant delivery of consumer goods looks more and more like just that — hype. Drones have a short battery life, and privacy concerns can be a hindrance, too. “I don’t think you will see delivery of burritos or diapers in the suburbs,” says drone analyst Colin Snow. Drone usage has grown rapidly in some industries, but mostly outside the retail sector and direct interaction with consumers. The government estimates that about 110,000 commercial drones are operating in U.S. airspace, and the number is expected to soar to about 450,000 in 2022. They are being used in rural areas for mining and agriculture, for inspecting power lines and pipelines, and for surveying. Amazon says it is still pushing ahead with plans to use drones for quick deliveries, though the company is staying away from fixed timelines. “We are committed to making our goal of delivering packages by drones in 30 minutes or less a reality,” says Amazon spokeswoman Kristen Kish. The Seattle-based online retail giant says it has drone-development centers in the United States, Austria, France, Israel and the United Kingdom. Delivery companies have been testing the use of drones to deliver emergency supplies and to cover ground quickly in less populated areas. By contrast, package deliveries would be concentrated in office parks and neighborhoods where there are bigger issues around safety and privacy. In May, the Trump administration approved a three-year program for private companies and local government agencies to test drones for deliveries, inspections and other tasks. But pilot programs by major delivery companies suggest few Americans will be greeted by package-bearing drones any time soon. United Parcel Service tested launching a drone from a delivery truck that was covering a rural route in Florida. DHL Express, the German delivery company, tested the use of drones to deliver medicine from Tanzania to an island in Lake Victoria. Frank Appel, the CEO of DHL’s parent company, Deutsche Post, said “over the next couple of years” drones will remain a niche vehicle and not widely used. He said a big obstacle is battery life. “If you have to recharge them every other hour, then you need so many drones and you have to orchestrate that. So good luck with that,” he told The Associated Press. Appel said human couriers have another big advantage over drones: They know where customers live and which doorbell to ring. “To program that in IT is not that easy and not cheap,” he said. Analysts say it will take years for the Federal Aviation Administration to write all the rules to allow widespread drone deliveries. Snow, the CEO of Skylogic Research, says a rule permitting operators to fly drones beyond their line of sight — so critical to deliveries — is at least 10 years away. A method will be needed to let law enforcement identify drones flying over people — federal officials are worried about their use by terrorists. While the rules are being written, companies will rely on waivers from the FAA to keep experimenting and running small-scale pilot programs. “People like DHL and the rest of them (will say), ‘Hey, we can deliver via drone this parcel package to this island,’ but that’s not the original vision that Amazon presented,” Snow says. There is a long list of FAA rules governing drone flights. They generally can’t fly higher than 400 feet, over many federal facilities, or within five miles of an airport. Night flights are forbidden. For the delivery business, the biggest holdup is that the machines must remain within sight of the operator at all times. In June, the National Academies of Sciences, Engineering, and Medicine said the FAA was being overly conservative in its safety standards for drones. The group said FAA’s risk-averse attitude was holding back beneficial uses, such as drones helping firefighters who are battling a fierce blaze. Even before the criticism by the scientific panel, the FAA had begun to respond more quickly to operators’ requests for waivers from some rules, says Alan Perlman, founder of the Drone Pilot Ground School in Nashville, Tennessee. He said it is also getting easier and cheaper to buy liability insurance. To Perlman, the billionaire’s optimism made perfect sense. “When you’re in his world you think more about technology than regulations, and the (drone) technology is there,” Perlman said.